If you weren’t lucky enough to get one early like Pee-wee Herman was and you’re not turned off by Apple’s intentional vagueness about what the device can do, its battery life, lack of initial 3G support, and the tablet apps launching with the iPad, then feel free to get in line on March 12, 2010. 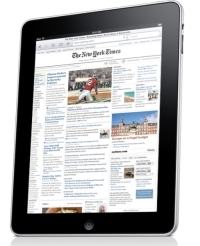 That’s what Apple will start taking preorders for all flavors of the iPad, with a launch date set for April 3, 2010. When I say there are a lot of questions surrounding the device, I mean there are a lot of questions. First and foremost, why the Wifi version at launch, and no 3G version until late April or even early May? Why the month delay between the Wifi and 3G? And why the month delay on the international version? I mean, the delay on the international version I can understand, because companies still depend on that staggered launching date technique to keep profits consistent throughout the year. But no 3G? What’s the deal with that? And why is 3G so much more expensive than the Wifi version? There are a lot of reasons to avoid the iPad at launch; these are just some of them. I recommend waiting for a few months before picking one up, assuming you can’t wait for the second generation iPad to launch.